Heat oven to 325°F. In medium microwavable bowl, shred pork; discard juice. Toss pork with orange juice and cumin; set aside. In another medium bowl, mix tomato, avocado, lime juice, sugar and salt. In food processor bowl with metal blade, place 1 1/2 cups cilantro, the peanuts, garlic, chile and oil. Cover; process about 30 seconds or until well blended; set aside. Heat taco shells in oven as directed on box. Meanwhile, cover bowl of pork mixture with microwavable paper towel. Microwave on High 2 to 3 minutes or until warm. 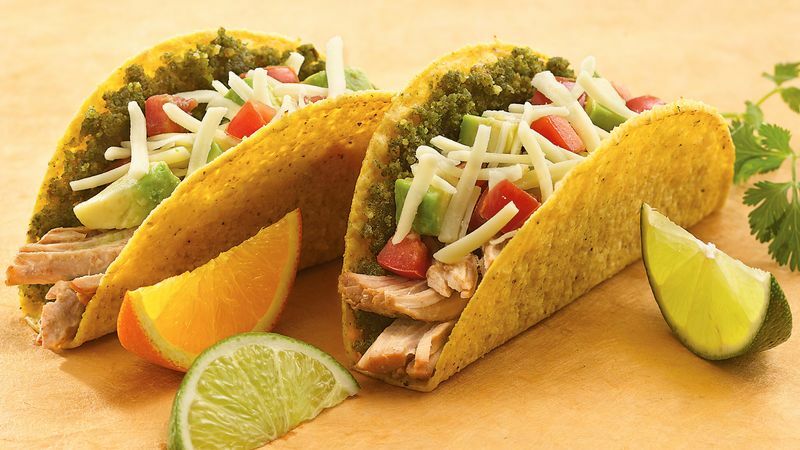 To serve, spread about 1 tablespoon pesto over 1 side of each taco shell. Fill each with about 1/4 cup warm pork mixture, 1 tablespoon tomato-avocado mixture and heaping 1 tablespoon cheese. Serve garnished with lime wedges, orange wedges and cilantro sprigs.